1. Hao Stars micro mill SS-GWM series (English species of Advanced Micro Devices mill, Micro Grinding Machine) has a compact structure, smaller, easy operation and maintenance simple, clean fast, light weight, high yield, fine grain size, temperature rise of the small high-efficiency advantages. 2. Hao Stars micro mill with the material contact parts are stainless steel and other high-quality materials, the core components of the machine moving disc (fixed grinding) and static disc (fixed grinding) using a special alloy steel or stainless steel and other high-quality materials made , and through the enhanced processing, high strength, corrosion resistance, according to the different processing of materials, can be customized to replace the different requirements of types of disc. 4. Hao Stars ultra precision grinding mill is equipped with adjustable gap control system, flexible operation, accurate and in place, convenient and reliable. 5. Hao Stars micro mill is equipped with dual cooling water circulation system (national patent) can effectively play the role of materials, greenhouse control. 6. Hao Stars SS-GWM series micro grinder has a good high-wire-speed dispersion, shearing, grinding, crushing (wet grinding), uniform quality, mixing and other multi-functional. 7. Hao Stars micro mill wide range of uses, suitable for food sauce paste, seasoning sauce, export salad sauce, boiled bamboo shoots sauce, tomato paste, paint, plastic colorants, asphalt emulsion, various paints and dye process is more difficult micro-materials processing, especially for peanut butter, hot pepper sauce, spicy sauce, hot pot sauce, rapeseed, sunflower, mustard, cocoa beans, almonds and other high oil content of materials processing. Hao Stars series AMD mill produced by special materials, high-speed rotation of the moving disc (fixed grinding) and static disc (fixed grinding) of the tooth main body composition, static and dynamic of the gap between the disc can be fine-tuned system, According to the required fineness index of arbitrary adjustment adjustment plate system (running on the machine can also be by regulating the dynamic and static disc to control the gap between a slurry fineness requirements), are processed material from the hopper into the disc between the tooth The high shear and complexity of the work of the vortex gap, under the influence of centrifugal force into the relative motion of the moving grinding and grinding between the fixed, through its variable grinding gap between the tooth by the high-speed rotating disc produces a strong centrifugal force, irregular upper and lower edge of the disc swirl and complex multi-stage grinding tooth thinning shear, scattered, broken (wet grinding), uniform quality, mixing and other multi-functional ultrafine grinding, so as to achieve the ideal of material thinning effects. 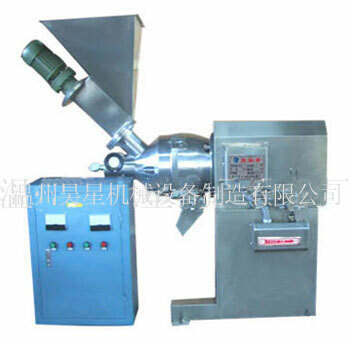 Order Information: Purchasing Hao Stars Micro Mill GWM series of products of enterprises according to size and paste or sauce such as production and processing of wet material in different media, as well as its status such as: Solid content (%), stiffness (%), viscosity (cps CPM), particle (mm) of the different requirements of material, selection of micro mill, such as processed material viscosity ≤ 10000 centipoise CPM or stiffness ≤ 25% or more, please select a model than the design requirements for large or high-power motor models or using other structural equipment.